It’s pumpkin season baby! 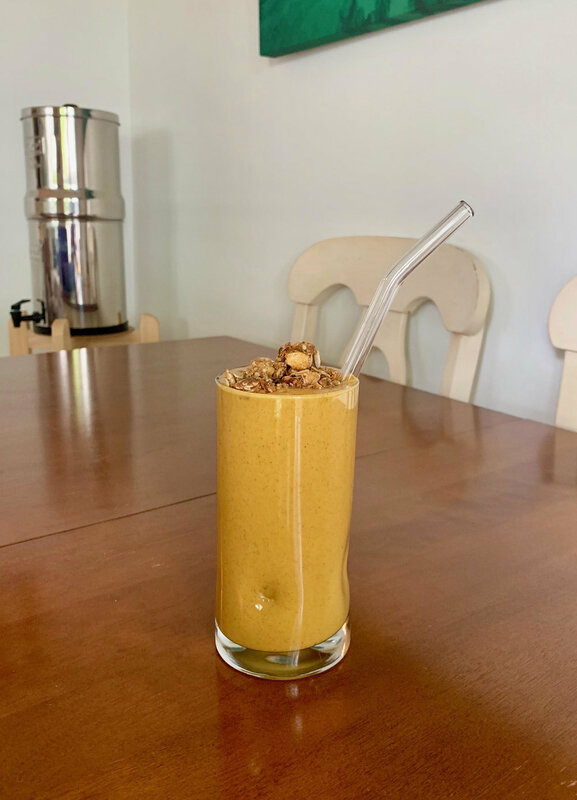 If you’re still holding onto your beloved coffee shop pumpkin spice latte it’s time to swap it out for this pumpkin pie smoothie. I’m not going to go into how terrible PSL’s are for you, how full of sugar they are or how many calories they are. I’m not. What I am going to go into is the health benefits of this pumpkin pie smoothie I just made, which can also be a smoothie bowl by the way. Since you know I like to eat functionally aka every ingredient has a purpose, I thought I’d break down a few top ingredients and their health benefits below for my fellow food geeks. Bananas are made of 76% water and are packed with vitamins such as vitamins C and B6 and minerals such as potassium, copper, and manganese. This high water/nutrient ratio makes them a great electrolyte food perfect for busy moms, workout enthusiasts, and people on the go. Bananas are also an excellent “brain food” great for heavy thinkers and are known to help build strong muscles as well as strengthen the nervous system. Pumpkins are an excellent food for aiding weight loss and for reducing cholesterol. The high amount of phytonutrients in pumpkin have been shown to help prevent the risk of cancers, particularly mouth, lung, and colon cancer. Pumpkin also contains several anti-aging benefits and the antioxidants help to keep skin wrinkle-free and radiating a healthy glow. Pumpkin Pie Spice is made up of Cinnamon (rich in cell-protecting antioxidants and there is also some research to support that cinnamon may help diabetics better control blood sugar), Nutmeg (boasts small amounts of fiber, numerous B vitamins and minerals), Ginger (contains important minerals like iron, potassium and zinc. It may also help relieve minor digestive problems), and Allspice (reduces inflammation, aids in digestion, boosts immunity, improves health of teeth, protects heart, improves circulation, and is high in antioxidants). Word of caution: if you have existing gastric ulcers or ulcerative colitis, it is best to avoid using allspice, as it can exacerbate the conditions. Place all ingredients in a high speed blender and whiz up until smooth. Pour in your favorite class, stick in an earth-friendly glass straw, top with some crunch and enjoy! If you want to make this into a smoothie bowl, add 1/2 the amount of milk so it’s thicker and more spoonable, pour into a bowl, and top with pumpkin seeds, unsweetened coconut shreds, cacao nibs, and blueberries. If you’re interested in getting more support with cooking healthy in your kitchen I am offering meal planning packages that are personalized for you based on your goals. Whether you’re trying to gain weight, lose weight, follow a paleo, Whole30, AIP, vegan, vegetarian, leaky gut, prenatal/postnatal, kid friendly, etc. protocol I can help. Schedule a free consultation by clicking here. Older PostWHAT IS A CACAO CEREMONY?